The analysis of data that transforms high-throughput raw data into biologically meaningful information can present a challenge to clinical, translational, and basic researchers alike. The CRI Bioinformatics Core offers services and expertise designed to allow BSD investigators to take full advantage of high-throughput technologies. View a selection of publications partially made possible by our bioinformatics analysis work. The Bioinformatics Core’s work combines the use of powerful computing resources, advanced analytics tools, and a commitment to security to transform large amounts of raw data into meaningful results. We use the CRI’s high-performance computing cluster and large-scale storage resources, with which complex analytics can be executed in parallel or distributed environments to produce fast data processing rates, improving application performance and cost effectiveness. Through advanced high-throughput analytics solutions, we dig down to the root of each computational challenge and design the most direct path to a solution. All our work is protected with the CRI’s automated, resilient backup and security systems, ensuring data integrity and access controls that are aligned with standards required by HIPAA, FISMA, and other regulations. Planning an experiment? The Bioinformatics Core has created a guide to Bioinformatics Experimental Design to help you get the best results. For each project request, the Core creates a proposal for the researcher that includes the scope of deliverables, a timeline for completion, and the estimated cost. The execution of the project is guided by frequent discussion between researchers and bioinformaticians, with progress updates provided regularly. Project results are delivered in the form of a written report. Have you worked with us before? We’d love your feedback. We currently offer bioinformatics pipelines for genomic and proteomic data. We provide bioinformatics analysis service for single-cell transcriptomic sequencing data generated by different technologies, including UMI-based Drop-seq and 10x Genomics Chromium, as well as non-UMI-based CEL-seq and Smart-seq. Our pipeline consists of (1) data de-multiplexing; (2) read alignment; (3) processing of cellular and molecular barcodes; (4) read count table; (5) quality control and normalization; (6) removal of debris, dead cells, and doublets; (7) detect batch effects; (8) clustering and identification of cell subsets; (9) cluster visualization using tSNE or UMAP; (10) marker gene identification; (11) differential gene expression analysis; (12) GO term and pathway analysis. Our customized pipeline can also perform single cell lineage analysis and other study-specific analyses upon request. We provide bioinformatics analysis service for single-cell Mass Cytometry (CyTOF) data. Our pipeline consists of (1) pre-gating (removal of debris, dead cells, and doublets); (2) diagnostic analysis; (3) marker ranking; (4) clustering, identification, and annotation of cell subsets; (5) cluster visualization using tSNE or UMAP; (10) differential analysis, including differential cell population abundance, differential analysis of marker expression stratified by cell population, and differential analysis of the overall marker expression. Our customized pipeline can also be incorporated into other study-specific analyses upon request. We also offer custom-made pipelines and expertise for types of analysis not listed above, including genome-wide association studies. Email us to get started! Our team of bioinformaticians offer a diversity of experience and areas of expertise. Meet the team at the link below and learn more about the scientists you’ll be working with. 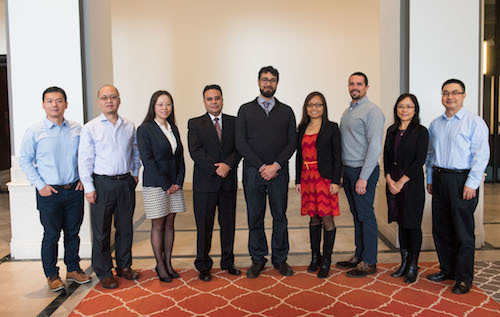 Pictured from left to right: Wen-Ching Chan, PhD; Wenjun Kang, MS; Yan Li, PhD; Jorge Andrade, PhD; Tzuni Garcia, PhD; Riyue Bao, PhD; Kyle Hernandez, PhD; Chunling Zhang, MS; Lei Huang, PhD.